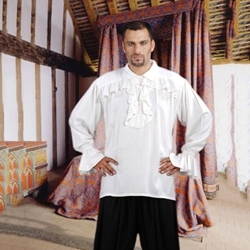 Our Plus Size Francis Drake Pirate Shirt is made with rayon fabric. This shirt features a ruffle along the front of the shoulders as well as down the chest. A long ruffle at the cuff finishes the look.